When I was younger, I still believed that I would obtain my “fifteen minutes” of fame. I thought that I would be famous for my writing or research or something. I suppose those are the dreams of youth, usually unrealized. As we grow older, we begin to understand that only a few people become famous, and then often for the wrong reasons. 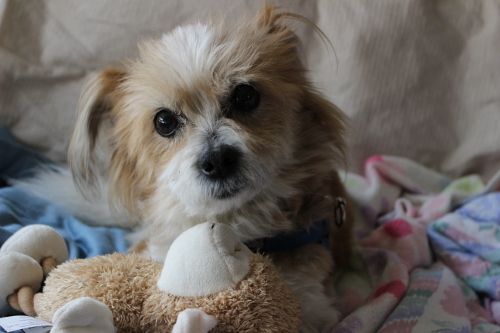 We had our moment recently when our little dog, Anakin, appeared on CuteOverload. As a proud dog mom, I was overjoyed. He had finished chemotherapy not long before his appearance, and so that made the honor even more sweet. He was a survivor, and he was cute! It was a win for all those little dogs out there who have gone through some pretty tough circumstances and lived to strut their stuff. Sure, I’d still like to be a famous writer or at least get a few accolades. But caring for Anakin during his illness and watching him play and enjoy his life after cancer, well that’s enough for me. I’ve made a difference in this little dog’s life, but he’s changed me for the better. He’s helped me to realize that sometimes we should let others have the limelight even as we support them from the shadows. That’s ultimately more fulfilling. Let other people have fame. I’ll gladly take my sweet little Anakin any day.